This is an archived Argonne News Release Item about the lab's nuclear energy legacy. ARGONNE, Ill. (Dec. 13, 1996) — While working at Argonne National Laboratory in 1948, physicist Maria Goeppert Mayer developed the explanation of how neutrons and protons within atomic nuclei are structured. Called the "nuclear shell model," her work explains why the nuclei of some atoms are more stable than others and why some elements have many different atomic forms, called "isotopes," while others do not. For this work, she shared the 1963 Nobel Prize in physics. Goeppert Mayer was only the second woman to receive the Nobel Prize in physics, following Marie Curie, and only the fourth American woman to win a Nobel Prize. 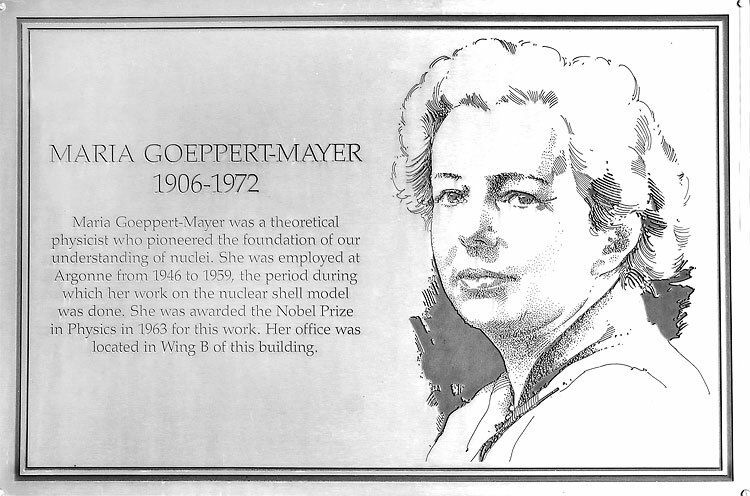 A plaque at the entrance of Argonne's Physics Building honors Argonne physicist Maria Goeppert Mayer. Click on photo to view a larger image. A member of Argonne's staff for 15 years, Goeppert Mayer studied theoretical physics under Nobel laureate Max Born at Göttingen University in Germany. She came to the United States in 1939 with her American husband, chemical physicist Joseph Mayer. An associate of Enrico Fermi, Goeppert Mayer took over his courses and worked on separating uranium isotopes as part of the Manhattan Project when Fermi left Columbia University to direct the University of Chicago's Metallurgical Laboratory, the project that created the world's first controlled nuclear chain reaction. Goeppert Mayer and her husband followed Fermi to Chicago in 1945. One of Goeppert Mayer's former students, Robert Sachs, hired her at Argonne at what he called "a nice consulting salary." Sachs would later become Argonne's director. At Argonne, Goeppert Mayer learned most of her nuclear theory and set up a system of "magic" numbers to represent the numbers of protons and neutrons arranged in shells in the atom's nucleus. While collecting data to support her nuclear-shell model, she was at first unable to marshal a theoretical explanation. During a discussion of the problem with Fermi, he casually asked: "Incidentally, is there any evidence of spin-orbit coupling?" Spin-orbit coupling occurs when two motions are coupled together, such as the earth spinning on its axis as it orbits the sun. In an atom, the electron spins on an axis as it orbits the nucleus. Goeppert Mayer was stunned. She recalled: "When he said it, it all fell into place. In 10 minutes I knew... I finished my computations that night. Fermi taught it to his class the next week." Maria Goeppert Mayer appears on a commemorative stamp issued by the U.S. Postal Service in June 2011. Click on photo to view a larger image. The following year, J. Hans Daniel Jensen independently advanced the same theory. Goeppert Mayer and Jensen received the 1963 Nobel Prize in for physics for their work on nuclear structure. They shared the prize with Eugene Wigner, who was honored for his elucidation of the mechanics of proton-neutron interaction. Wigner was also a Met Lab team member. 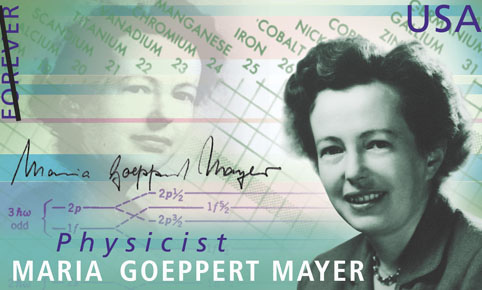 In 1960, Goeppert Mayer and her husband moved to the University of California at San Diego ,where she served as a professor of physics and continued research in nuclear physics until her death in 1972. Goeppert Mayer publicly encouraged young women to pursue careers in science. A plaque honors her at the entrance of Argonne's Physics Building, where she kept her office during her years at Argonne. Each year, Argonne grants the Maria Goeppert Mayer Distinguished Scholar award to an outstanding woman scientist or engineer early in her career. The award provides a salary and a cash award to enable the young scientist to conduct innovative research using Argonne's resources. The American Physical Society also recognizes outstanding achievement by a woman physicist in the early years of her career with an annual award named for Maria Goeppert Mayer. Nobel Prize-winning physicist honored with U.S. postage stamp - In June 2011, the Postal Service released a new stamp honoring Maria Goeppert Mayer, a Nobel Prize-winning physicist who worked at the U.S. Department of Energy's Argonne National Laboratory in the 1940 and '50s. The year also marks the 20th anniversary of the founding of the Women in Science and Technology organization at Argonne.